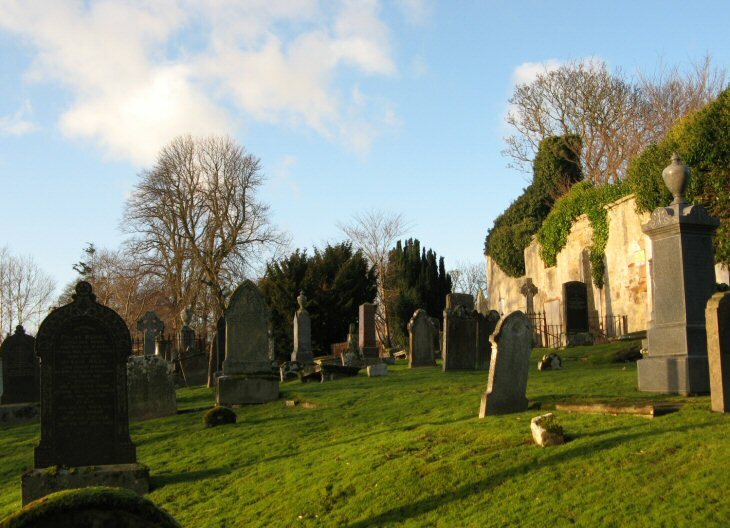 The burial ground of the former Alness Parish Church is on the western edge of the village, on the north side of the B817 road. The church is a roofless ruin, fenced off as a dangerous building. Modern cemetery extensions lie north of the old church. The town of Alness is divided between two parishes, Alness Parish and Rosskeen Parish, the latter lies east of the River Averon. Picture Added on 21 December 2008. Thanks for your time and work to make this page. Am tracing the Muirs and as I live in Australia this is the only way I can look at their home country. Added by Chris on 13 February 2009. I am searching for the gravestone of CHARLES FYFE died 3 December 1904 Lealty, Alness; and his wife MARY FYFE died 21 September 1916 Bridgend, Rosskeen. Added by Barbara Fyfe Young on 13 February 2012. Added by Greg MacThomais on 03 December 2014. I am looking for the grave of Rev AR Munro, who died on 28/8/1913. I have seen a photo of the grave of his children in Alness Cemetery and am hoping that someone can confirm that his grave lies there too. Added by Tim Reynolds on 07 September 2017. I am looking for the grave of George Campbell who had Mill Craig Farm. He died 1966/1967. Added by Michael Nicol on 01 October 2018. My great grand mother Annie Airlie nee Cameron, her husband Daniel Airlie .Are buried here to the right when you go in the gate.